highlighting the genius of the location. The hotel structure is an integral part of the surrounding mining region which recently became a UNESCO World Heritage Site. The region is the living memory of the industrial past that shaped the local scenery and people for centuries. The structure of the authentic row-houses was originally named Cité 9. A judicious use of tact was required to turn the old miners’ houses into a 4-star hotel, which we luckily and quickly found among local businesses. 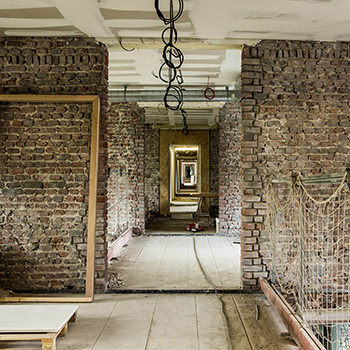 Architect Claire Duthoit (Maes Architectes, Lille) worked hand-in-hand with interior designer Guillaume Da Silva (Roubaix) to keep the authentic settings and the building’s sense of place intact. The regular pattern of the façades joined by two glass sections and a large garden now boasts 52 rooms, fitness and wellbeing facilities, conference rooms, a brasserie and a bar. The hotel is shaping the future history of a quite unusual destination which has become a must-see since the Louvre-Lens Museum opened, located just opposite the hotel (a 3-minute walk). What can you tell us about the main theme of the hotel design? The entire concept was based on a notion of duality. The outcome is a subtle hyphen between old and new architecture. We purposely used black in the rooms to create a sober, restful atmosphere, which is completely contrasted by the bright white bathrooms. 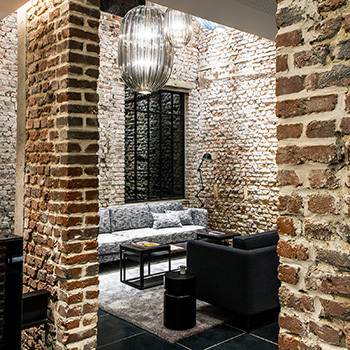 Another choice of contrasting materials can be seen in the preservation of the original, “scarred” bricks, which have been simply sanded, combined with new, precise features such as the furniture, custom-designed in-line with the elegant sobriety. 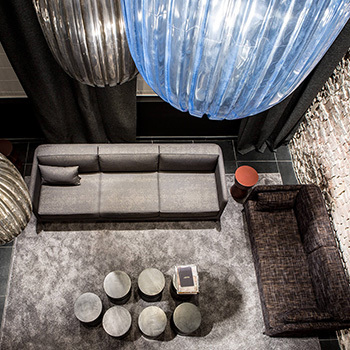 Three main elements underpinned the hotel design. All the subtle aspects involved in renovating the old and adding the new – which is what I call the “respectful clash”. 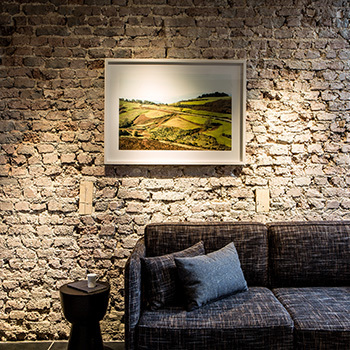 The sense of place via the historical aspects, such as restoring the original brickwork for example, as well as giving it a Northern identity integrated in the sober tones such as the black used in the rooms, recalling the coal mines. Where did you find your inspiration for the project? That was simple given the building itself provided heaps of inspiration! By taking the context of the rugged region and the simple building into account, the notion of duality became very clear. The visual of the raw bricks and black stone contrasts wonderfully with the silky carpets and fabrics. 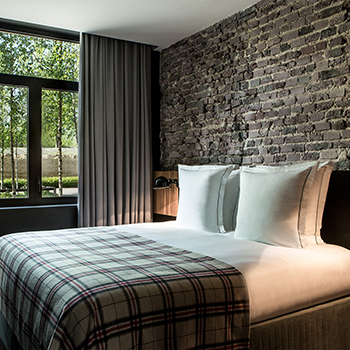 From an architectural point of view, we were greatly inspired by the black-painted brick facades in Holland. This allowed us to give the houses a new visual identity and a new vocation as a Hotel – Restaurant venue. We wanted to create a warm and friendly atmosphere for the interior ambiences, recalling the old boarding and guest houses. The hotel is designed to be both cosy and open to the exterior with large sliding glass doors and windows to enjoy the garden. What did transforming the old mining houses involve? We used black-washing to alter the face of the old mining houses. It was important to make a visible rupture with the original architecture. We also used symbolic elements recalling the site’s history like the fireplace in the lobby, which is another reminder of the mines and the foundry. The tones we chose, how various materials were integrated and the lighting are all references to the old industry. And the hotel obviously wanted to steer clear of any systematic use or banality regarding these references. Our job was to echo and create subtle, elegant reminders of the era. What makes the Hôtel Louvre Lens so unique? I would say it is the unusual aspect due to the old materials used, which are solid, like the oak, the raw blue stone, the floorboards made from early 20th century railway planks, the tin bar and the cement tiling. Cleverly offset aspects can be found throughout the hotel. Completely rehabilitating these houses has given the hotel a very unique character while contributing to local mining heritage conservation and boosting its value.